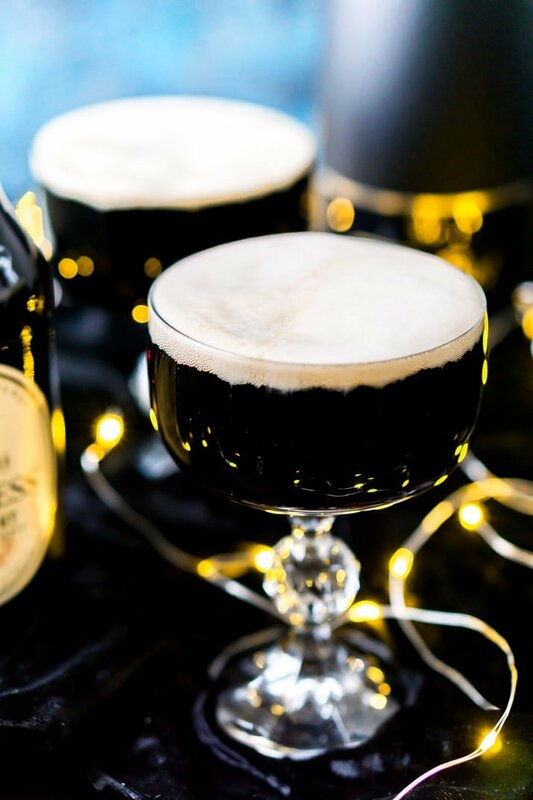 This Guinness and Champagne Black Velvet Cocktail is a deliciously easy drink made with stout and bubbly! The best quick cocktail for New Year’s Eve, St. Patrick’s Day, or just because! So, for as much as I love New Year’s Eve and all the glitter and gold and champagne, I honestly don’t remember the last time I made it until midnight, it’s been at least a few years and I don’t even have kids… seriously, no excuse. But it won’t stop me from mixing up a couple of cocktails like this Black Velvet for earlier in the evening. Even if you are planning on staying up and partying all night playing minute to win it games and taking turns in the photo booth, this is a fantastic drink option! I love this Black Velvet cocktail because of how easy it is to make! It’s just two ingredients, and you don’t need anything fancy to make it, just a bottle opener and a couple of glasses. 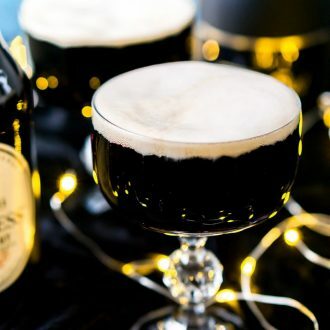 A Black Velvet is made up of Guinness and Champagne and yes, I know what you’re thinking, that sounds a bit weird, almost like it wouldn’t taste good. But you’d be wrong. The blend of rich stout and light bubbly actually makes for a downright delicious drink! The blend can be 2 parts champagne to 1 part Guinness or equal parts between the two depending on taste. It’s a simple 2-ingredient cocktail made with Guinness and Champagne. Where did the Black Velvet Cocktail originate? While generally considered an Irish cocktail, the drink originated in London following the death of Albert in 1861. 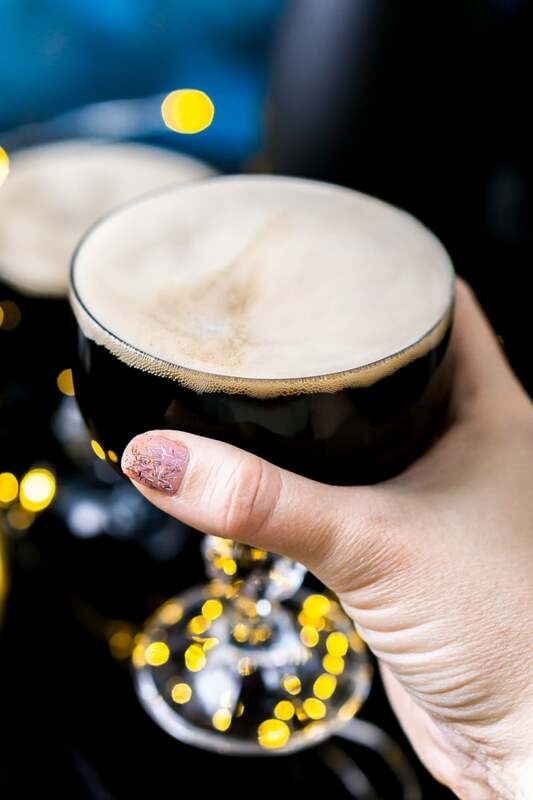 The bartender who created it felt that champagne was a celebratory drink, but that the Guinness would make it suitable for the mourning period. How do you Make a Black Velvet Cocktail? There are three ways to make this simple cocktail, the way you do it is up to you and the look you’re going for. Champagne First: Pour the champagne into the glass, then pour the Guinness in over the back of a spoon. The different densities of the liquid will allow the Guinness to float in the upper portion of the glass creating a pretty two-toned cocktail. Mixed Together: Pour in the ingredients in whichever order you want and stir to mix. Guinness First: This is my preferred mix of the cocktail. You get a nice and frothy head on the drink and I think it looks simple and refined. 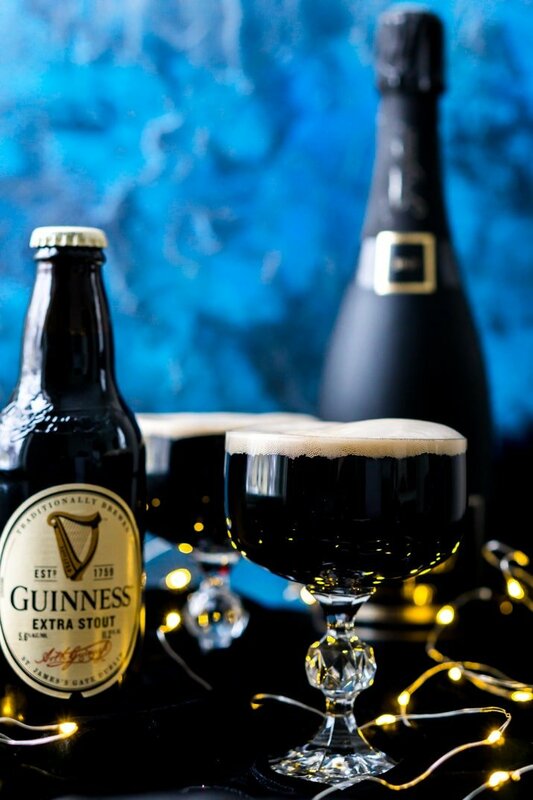 The combination of the Guinness and champagne yields a creamy, rich, and slightly fruity drink that is sure to impress! It’s simple, classy, and gorgeous. It’s a great drink for everything from St. Patrick’s Day brunch to black tie affairs. So I hope you’ll give it a try this New Year’s Eve! 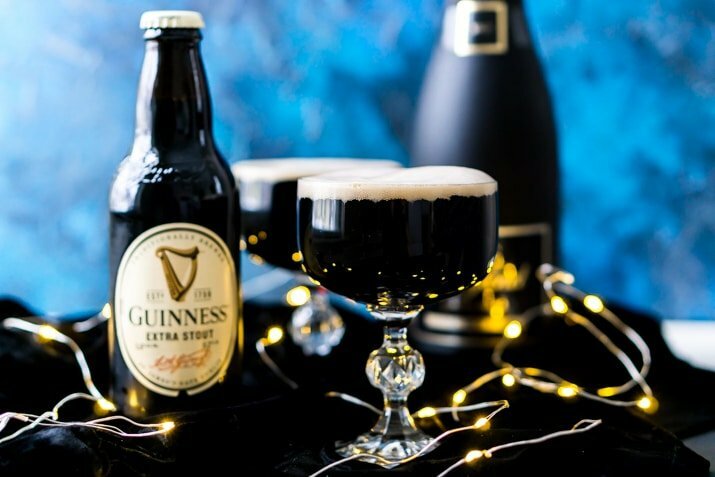 This Guinness and Champagne Black Velvet Cocktail is a deliciously easy drink made with stout and bubbly! The best quick cocktail for New Year's Eve, St. Patrick's Day, or just because! 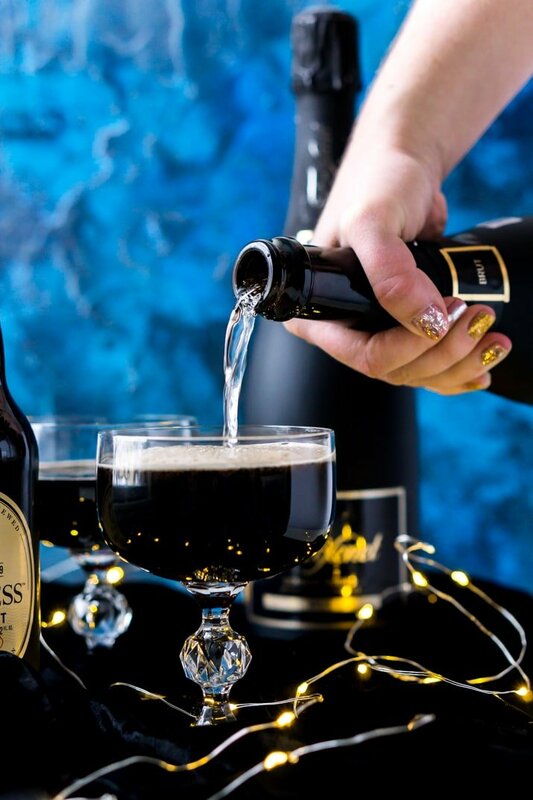 Pour Guinness into a glass and top with the champagne. 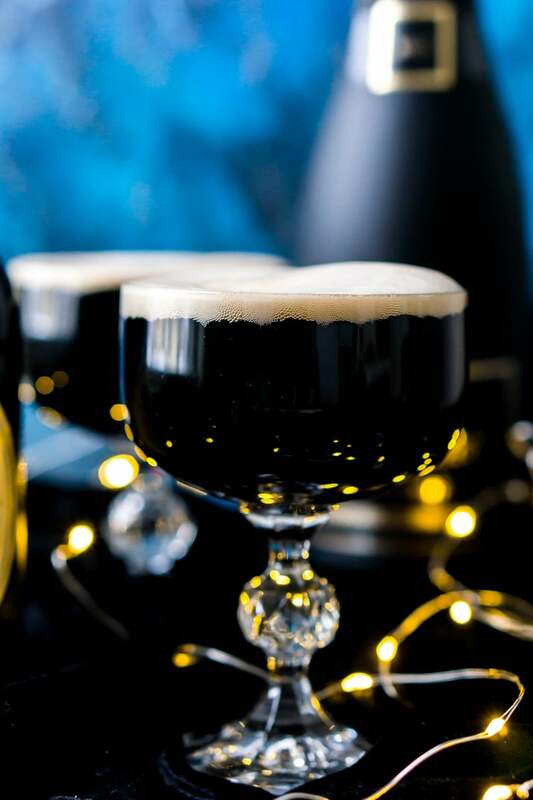 Pin this Black Velvet Recipe for Later! This cocktail is perfect for me and my husband! I always go for the bubbly and he’s a beer drinker. Combining the two is going to be simple and tasty! Yes! I think you guys have found a perfect combo! I’ve never had any stout although I have indulged in the bubbly!! It looks like a terrific drink and it’s one that I’ll have to try very soon. We have a special occasion coming up and I’m definitely going to give it a try. I hope you’ll give this cocktail a try real soon!